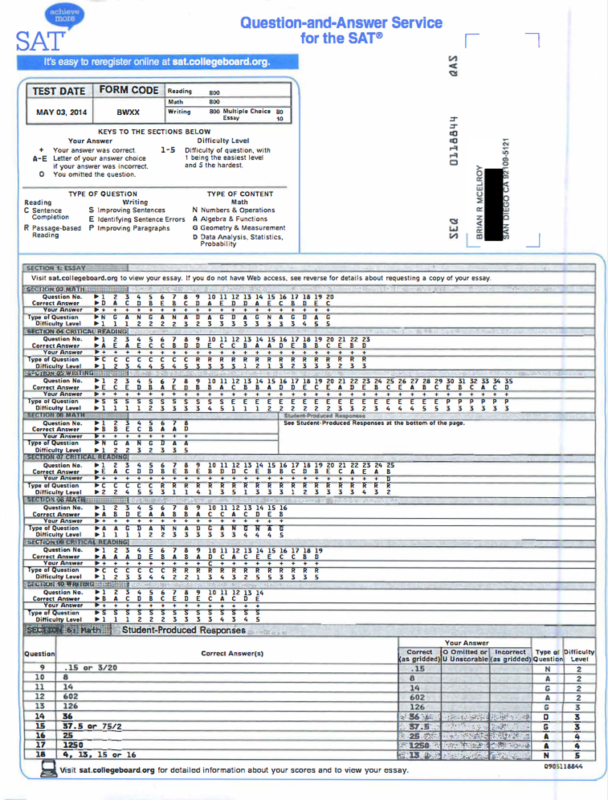 I Scored a Perfect 2400 on the May 2014 SAT. Well, I've said this a dozen times before, but every time I mean it just the same: this school year has flown by. Every year comes with its own set of unique challenges, but it inspires me to know that our work is never done. Even after 12 years in business, we can always get a little bit better at what we do. Three of my great passions in life are music, yoga, and teaching, and it's no coincidence that these are three areas of life in which "mastery" is unattainable. There is always something to improve upon. My students, especially once they get to know me, like to ask me this question: "So what did you get on the SAT?" And although I'm a bit wary of the question, since I know that the ability to score well on tests such as the SAT and ACT says little about one's ability to teach others how to do the same, I will usually answer it with some prodding. Way back in 1997, I got a 2270 (99%). Or, more accurately, I got a 1480 plus a 790 on the Writing test, since the SAT I took was out of 1600 points, and back then the Writing section was an SAT Subject Test. Even though my SAT score wasn't as high as I had hoped, I know that it was pretty darned good. But I was also 17 years old at the time. It dawned on me recently that although I have taken over a hundred practice SATs, I had not taken an official SAT in half a lifetime, and 1997 wasn't so recent anymore. So I would be a hypocrite if I didn't give it another shot. Plus, taking the test would allow me to simulate the experience that my students go through, and help me stay up-to-date with any test changes (especially with the redesigned SAT looming on the horizon). Consequently, I signed myself up for the May 3rd SAT. Although I expected to do well, having been preparing my students for the test for the last 16 years, I wasn't quite sure what to expect. My main goal was to make sure that I did better than my 17 year-old self! I'm happy to say that I scored a perfect 2400 (99.98%), and that I definitely learned / re-learned a few things in the process. 1) Time pressure is a significant factor and cannot be overstated. I like to give my students more than one way of answering every question, but in reality you sometimes cannot double-check everything. This is why preparation is essential--you don't get many second chances on the SAT, so your first response needs to be the easiest and most efficient response. It's much more effective to prevent mistakes in the first place than it is to correct them after the fact. 2) A calculator is absolutely essential on the math--preferably a graphing calculator such as the TI-83 plus. There are certain questions which are much easier with the right calculator, and it saves you lots of time overall. Calculators are especially helpful for rote arithmetic, saving your brain power for the wording of the questions themselves (since there are so many word problems on the test). 3) When in doubt, go with your first instinct, unless you notice something that you had not seen previously. I had a few questions on the Critical Reading portion that I wasn't 100% sure about, but I trusted my initial answer and it paid off. 4) Write relatively small on the essay--there are only two pages--and make a point to use advanced vocabulary. (This is your opportunity to take advantage of all those new words you learned that didn't show up on the test.) Also, try to fill all of the horizontal space, or else it looks like you are trying to make your essay look longer than it is. Students who are used to the ACT essay (4 pages) might make the mistake of writing too big and running out of space at the end. And the SAT is starting to reward complexity of arguments, rather than cookie-cutter essays, so try to make it unique and don't be afraid to take a few chances if you're going for a 12/12. 5) Bring a stopwatch and check in every few minutes. If you hit upon a question that is frustrating or taking you too long, do not let it drag you down! Take a "placeholder" guess, move on to the next question, and come back to it later. I did this on the final math section, on a complicated simultaneous equation question involving three different equations (which can be frustrating because there is no one "right" way to do it--they just require patience and several tries), and it made the difference between a 770 and an 800. As soon as I felt myself getting a bit annoyed with how long it was taking me, I skipped ahead to the next question. When I returned to that question at the end, I knew that I could use all of my remaining time to figure it out, and I did. I certainly don't expect to get a perfect score every time I take the test, but it was a nice bonus. I plan to take the SAT and ACT up to 3 times a year from now on, and I encourage any serious tutor to do the same. 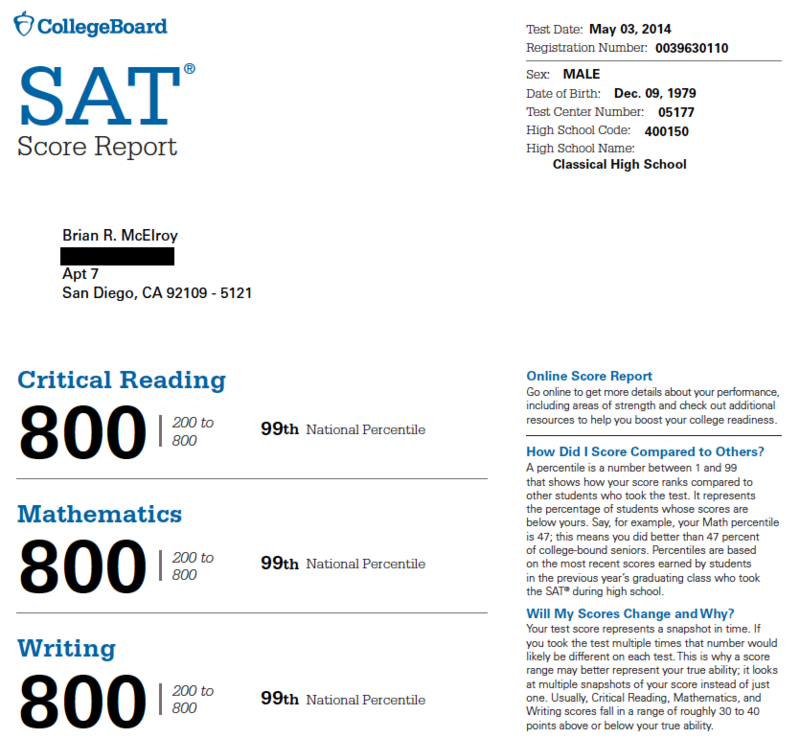 UPDATE, OCTOBER 2016: I also scored a perfect 1600 on the New SAT.